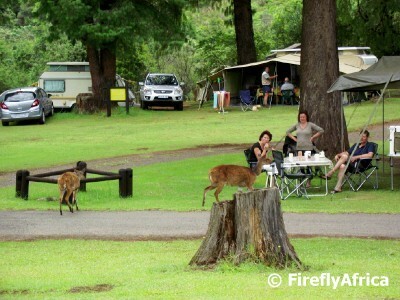 Camping at Mahai in the Drakenberg we noticed a couple of Bushbuck roaming through the campsite. They weren't tame, but quite clearly used to and comfortable around the campers. The honorary rangers told us that its a female with her young that often spend time around the campsite and when the young one was a baby she sometimes left here close to the ranger's building while going off on her own. We spotted the male outside the camp area next to the road one day and apparently he doesn't venture in between the tents like the female does. The one afternoon I was sitting on the grass with Drama Princess eating apples when the female slowly came closer. Although she was very careful, she came right up to us and even ate apple from our hands. At first Drama Princess was very nervous and unsure, but after seeing that there was no danger she actually fed the antelope as well. When we first moved into our house seven years ago I was very glad to hear the Burchell's Coucals (known in Afrikaans as Vlei Loeries) - (Centropus burchellii) in the mornings. The have a very fast and distinctive doo-doo-doo-doo-doo call which I love. But although I often hear the birds in the mornings, I rarely get to see them as they are very shy and live and nest in dense vegetation. The other day I came home and noticed a dead pigeon chick lying under one of our palm trees, but didn't even give it a second thought. Shortly after I had to pop out to the local Spar for a couple of things and as I reversed out I spotted something out the corner of my eye. 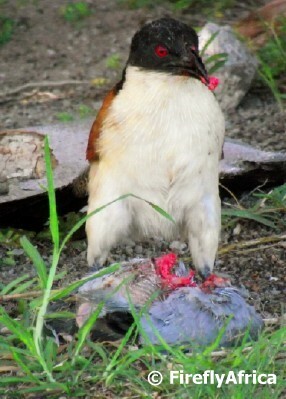 I stopped to have a look and there she was, sitting on the grass and digging into the unexpected little morsel. "WOW!" I thought. This is a very unusual sight. 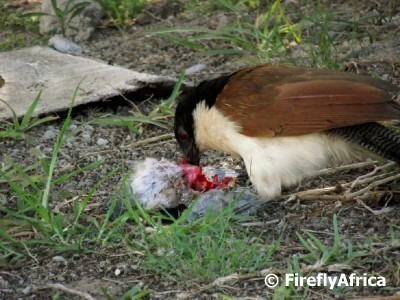 I have always known that they are very voracious predators feeding mainly on small animals and that they rarely eat fruit, but I have never seen one feeding. 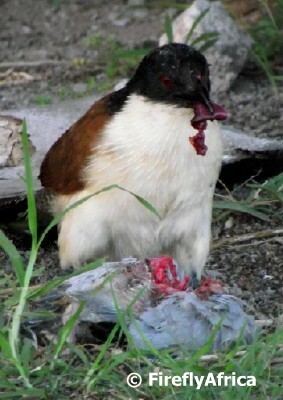 I don't even think I've seen a picture of one feeding. So for me this is a very rare find and I am so glad she allowed me to sit there and take a couple of pictures before she ripped off a big piece and presumably flew off to the nest. Driving up the Olivierhoek Pass over the Drakensberg in comfort only having to dodge the occasional pothole, I was wondering how tough it must have been for the Voortrekkers to get down this mountain during the Great Trek in 1837. 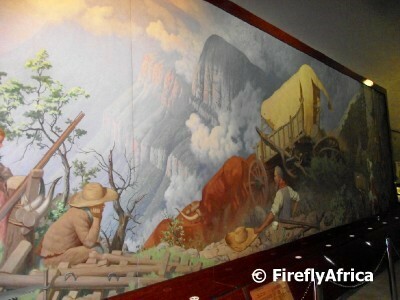 On a visit to the Voortrekker Monument outside Pretoria I saw the painting above and I imagine it must have been one of the most dangerous parts of their journey. Finding the best place down and then making your own path to take a fully laden ox wagon as well. 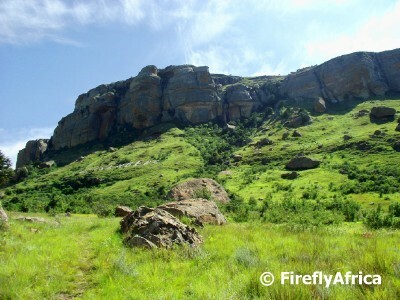 The original trail carved by the Great Trek's ox wagons is known as Retief Pass (sometimes also called Voortrekker Pass). 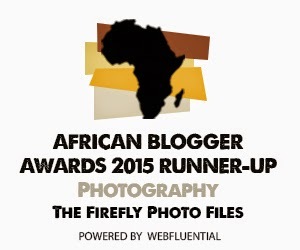 It is down this path that Piet Retief's party went in 1837 in their quest for freedom and a land of their own. Standing on top of the mountain at this point it doesn't look to challenging, but the first problem would have been finding this spot and then to make your way down it. The pass was declared a national monument in 1977 and at the top of the mountain stands a small pyramid to mark the spot where the pass starts. From this spot you can see the Kaalvoet Vrou Monument, while Retief Rock is only a few kilometers away. To get to the monument you have to take a dirt road for about 20 kilometers or so, but it was quite decent and I did it very easily in my Chev Aveo. 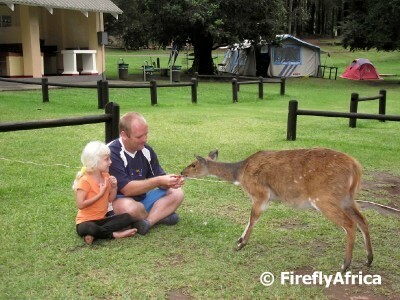 One of the things I was quite anxious to see when I was in the Drakensberg area was Retiefklip. I asked at the resort where we were staying how to get there and was told that the road was very badly damaged in the rain that fell in the week or so before. Seeing that I probably won't get back to that area soon again, the explorer in me decided to take a chance anyway. I don't know where the young lady got her information, but other than having to carefully navigate my Chev Aveo past one or two badish spots, the road was better than a lot of gravel roads I have travelled on. The Great Trek reached this area in 1837 after traveling from the Cape Colony (Eastern Cape and Western Cape) through the Free State. The Voortrekker put up their laager in the shadow of the mountain in the picture above and a service was held to thank God for protecting them and bringing them this far. 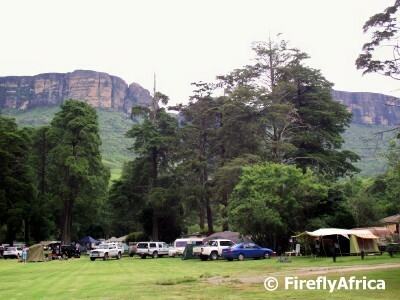 The Voortrekker called the mountain Kerkenberg (Church Mountain). 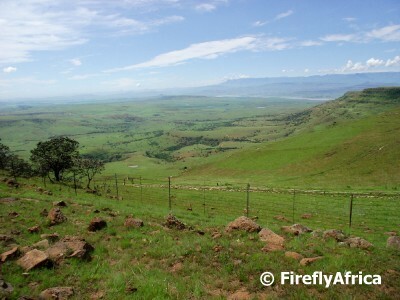 Upon arriving in the Free State, there was a dispute amongst the Boers as to the final destination of the Great Trek. One of the main leaders, Piet Retief, chose Natal. On 7 October 1837 he left the laager with 14 men to scout Natal in advance. 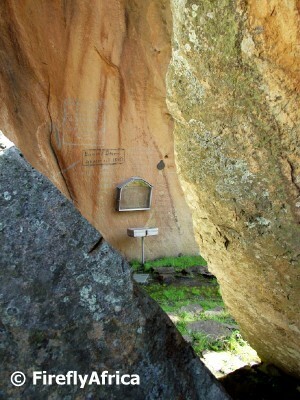 On 12 November 1837, his daughter Deborah painted her fathers name on a rock below Kerkenberg to commemorate his birthday. 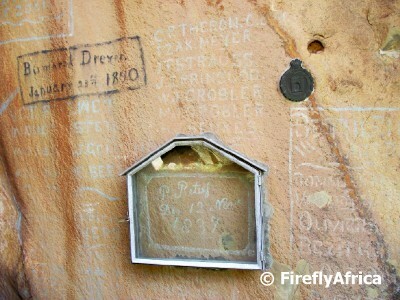 The original writing done by Deborah has been enclosed in glass to preserve it. Around it a lot of other graffiti have been added over the years. Some of it date back to the 1800's, but unfortunately some has been added in later years by folk who feel nothing for heritage sites like this one. 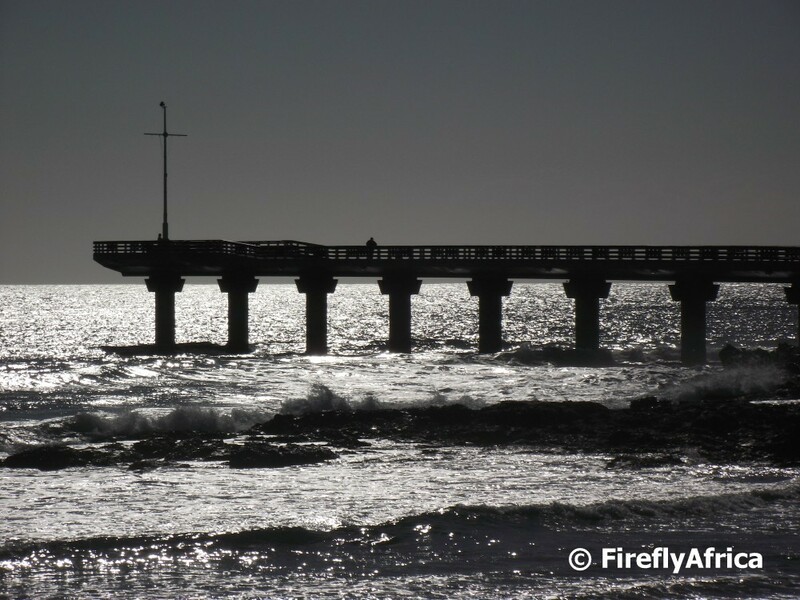 Shark Rock Pier in Port Elizabeth in the early morning sun with the ocean shimmering more than a vampire in the Twilight movies. Caroline posted a picture of a protea with a bee in it over the weekend and I thought I should try and go one better. 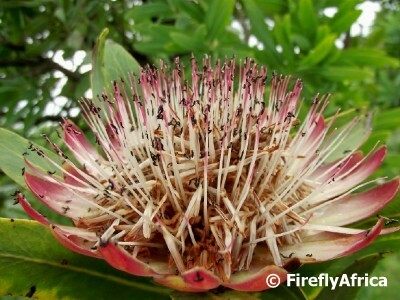 Not the picture itself, but what is in the protea. 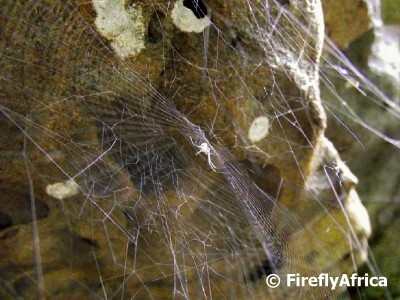 In this case not just one better, but many little flying insects. Another one of those moments in the berg I couldn't resist. 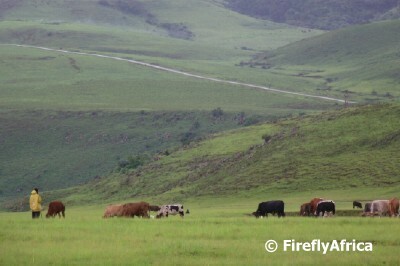 A young Zulu man minding his herd of cattle on a rainy day. Pity though you can't see the peaks of the mountains in the background, but it was in a valley so you can just see the hill side. 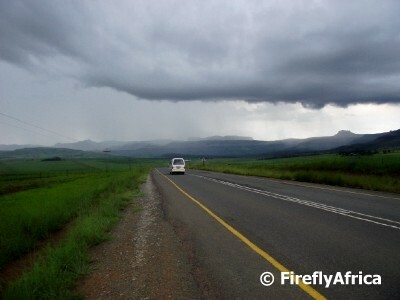 I have mentioned in earlier posts that we had lots of rain during our visit to the Drakensberg. We headed into the town of Bergville to stock up on food and driving back towards the mountain we could clearly see it raining up there. Looking at the scene above, our campsite was - yes you guessed it - slap bang in the middle of that massive downpour in the middle of the picture. Don't get me wrong, we still had a fabulous time in the Berg. That all the pictures I have already posted and will still post is proof of. You know when you wish you had another chance at doing something? Well, this is one of those occasions. 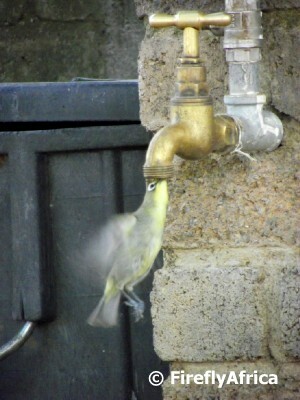 I was in my camp chair fiddling with my camera when I noticed the little Cape White-Eye sitting on the tap. I just had a feeling that he was going to do what he did and there was only enough time to zoom, focus and click one picture before he flew off. Oh how I wish I had my tripod set up for a clear crisp picture of him drinking from the tap. 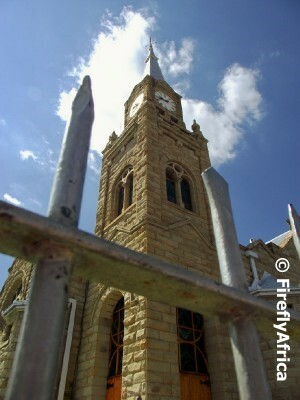 The town of Aliwal North is situated in the North Eastern Cape next to the mighty Orange River, which is the boundary between the Eastern Cape and the Free State. 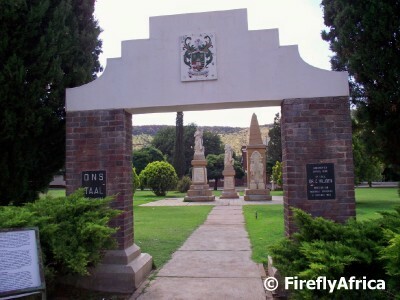 The town was formally founded in 1850 by Sir Harry Smith who named it "Aliwal" in memory of his victory over the Sikhs at the Battle of Aliwal during the First Sikh War in India in 1846. He added the "North" in opposition to Aliwal South (now Mossel Bay) to avoid confusion. 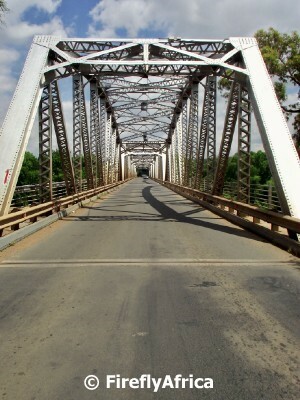 The first bridge over the Orange River next to the town was the Frere Bridge which was built in 1881. This was replaced by the General Hertzog Bridge in 1937. The stone Frere Bridge was demolished after it was replaced as it was very close to the new bridge and they were afraid that if something happened to it that the new bridge wmight be damaged. 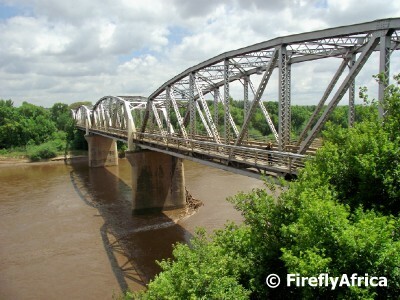 The steel General Hertzog Bridge is a prime example of a truss bridge. 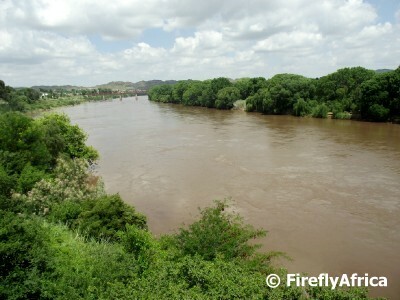 Standing on the bridge, this is the view I had of the Orange River as it flows across South Africa in a westerly direction. 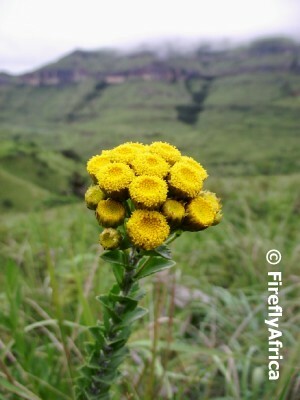 Seeing that today is the day of love and flowers are (or at least should be) associated with Valentines Day, I have decided to post a selection of flower pictures taken in the Drakensberg. 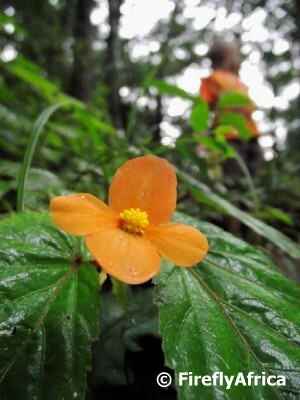 I took the picture of the orange flower on the Tugela Gorge hiking trail. I specially like this picture because Chaos Boy in his orange shirt is visible in the background. 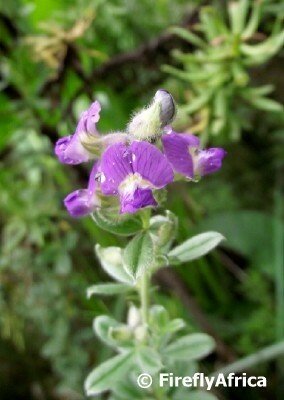 My flower knowledge is scary at best, so I will just call this a pretty purple flower. These little yellow flowers (see, no name again. I'm sad, aren't I?) 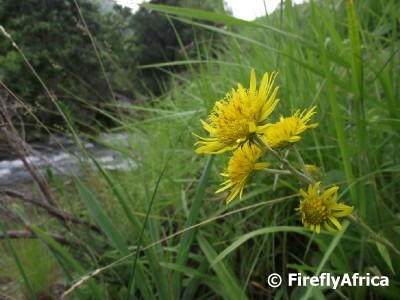 grew next to one of the mountain stream. Unfortunately it was very cloudy and its not the brightest of photos. Happy Valentines Day everybody!!! 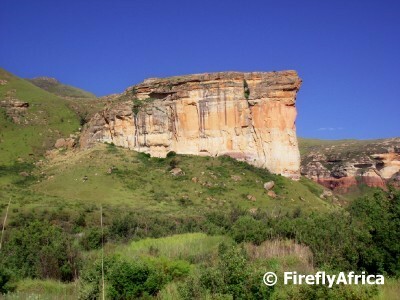 One of the most famous landmarks in the Free State is the imposing Brandberg (burning mountain) rock in the Golden Gate Highlands National Park. 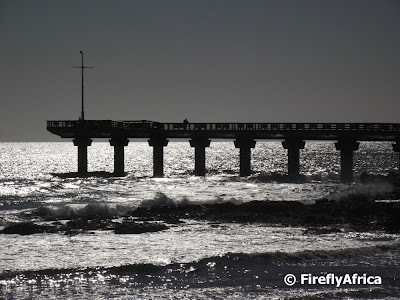 We passed through Golden Gate on our way to the Drakensberg, but unfortunately the day was starting to get late and we still had some distance to drive. This meant that there wasn't any time to hang around and take in more of the park. Very disappointing, but definitively something that will go onto the "places to visit in future" list. 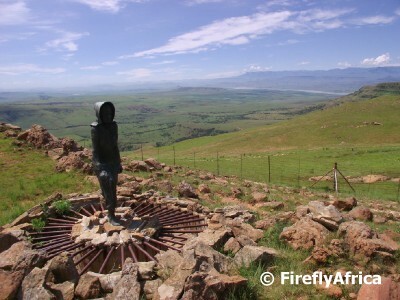 At the top of Voortrekker Passstands a monument to a woman walking barefoot over the Drakensberg. After the Voortrekkers entered Natal, which was a British Colony in those days, in 1847, there was a number of trekkers who wanted to return to the Free State. 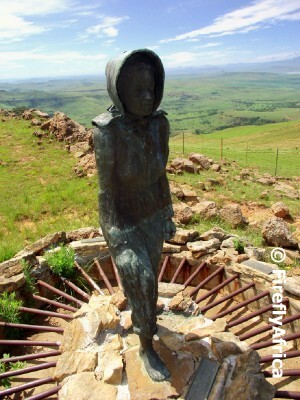 Susanna Smit, sister of Gert Maritz, one of the Voortrekker leaders, declared that she would rather trek barefoot back over the Berg than live in Natal under British rule. 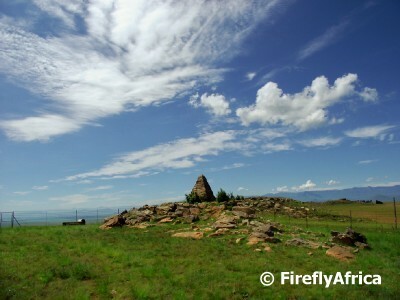 The monument was erected in 1977 and stands very close to the Voortrekker Pass Monument. But that's another post. I was Googling to try and find out if she actually ended up walking across the mountain barefoot. It seems that she died in Natal which means that she never did. 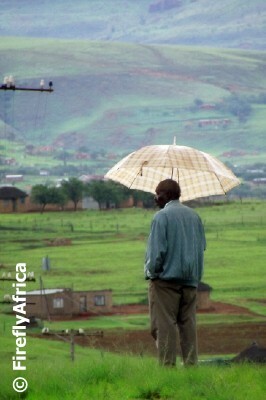 I found this old man standing in the rain with his umbrella studying the landscape during our Drakensberg holiday. The scene just caught my eye and I had to pull over and take a photo of him. 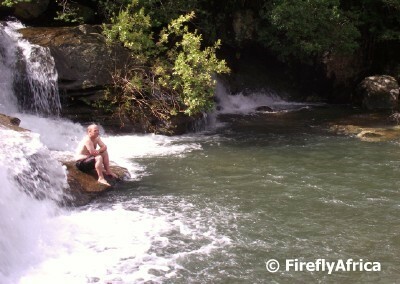 As I mentioned in my post about Mahai Campsite in the Royal Natal National Park last week the campsite has no swimming pool and you swim in the Mahai River at the Cascades Waterfalls. 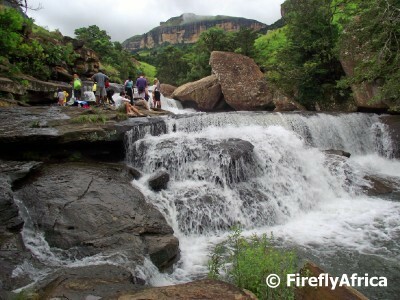 Cascades is about 500 meters from the campsite. 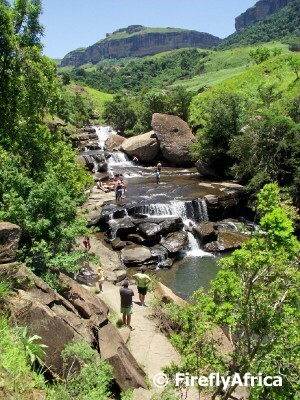 Its a very easy walk to Cascades along a paved walkway and you get the view above just before climbing down to the river. 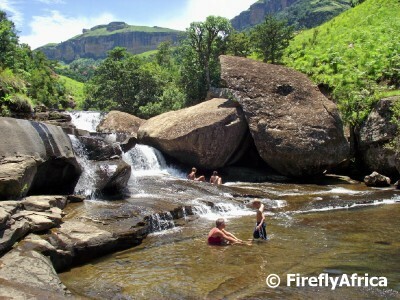 There is a nice (not to deep) pool at the bottom of the falls for you to swim in, while the upper area is shallow and on flat rocks, making it ideal for small kids. Before all the rains came it was also quite nice walking in right under the falls for a "shower". I have to say though that the water isn't just your ordinary pool water. Even though it was in summer and the weather hot and balmy, the water still originates in the mountains above and is refreshing to say the least. Then the rains came and the Cascades had a bit more white water. Didn't stop the visitors from still swimming in it though. The water did feel just a little bit colder though. Yours truly having a contemplation moment on the rocks at the bottom of the falls. When I drive into a small town I've never been to, the first thing I always do is scan the horizon to see where the local church is. Just about every small town has a beautiful historic church. 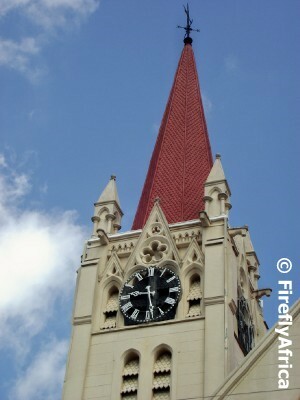 The first one is the Dutch Reformed Church (completed in 1849), but I'm not too sure right now about the second one. 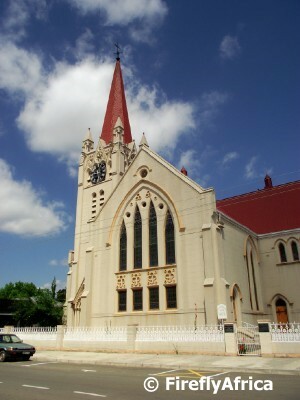 It could be the Christ Church which was built in 1861. 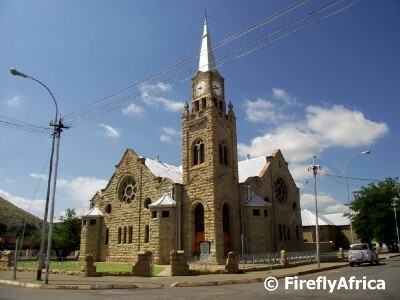 The congregation of Burgersdorp was founded in 1846. The name 'Burgers' was to honour the farmers(burgers) who brought Christianity to this area. In 1847, 75 stands were sold by public auction and the first nine streets, 2 squares and an area for the church were demarcated by plough and oxen. 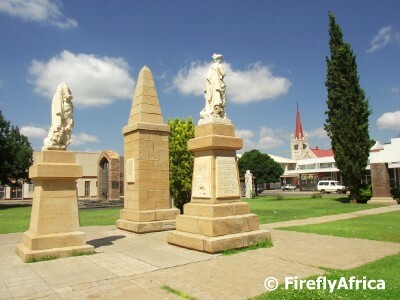 Driving through the town of Burgersdorp in the Eastern Cape, visitors will pass a park called Burger Square with a collection of monuments in it. One of the monuments (actually two, but if you keep on reading you will understand) is a monument to the Dutch language which is mainly out of what the Afrikaans language developed. The statue, made from Carrara marble and built in Italy, was originally erected in 1893 in honour of equal rights of Dutch and English to be used in the Colonial Parliament. The original statue was damaged and removed from its base in 1901 by British Troops during the Anglo Boar War. 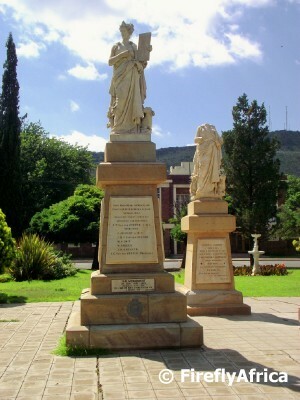 After the war the British Government was pressured by the inhabitants of Burgersdorp to pay for a replica to be made to replace the missing one. The new monument was unveiled in 1907. 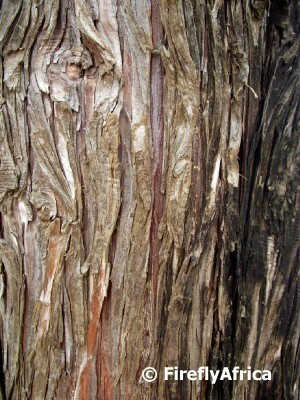 The original monument was found, minus the head, buried in King William's Town in 1939. It was brought back and erected next to the new monument where it stands today. 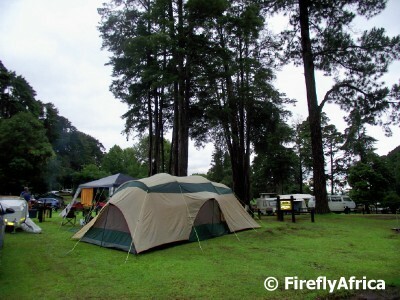 During our December camping holiday in the Drakensberg we spent 10 days at the magnificent Mahai camp site in the Royal Natal National Park. The camp site came highly recommended from various people and one of the main reasons we decided on it is because its right up in the mountains and not some distance away. The best part was that if you wanted to go on the hikes in the park you just needed to walk out the camp site gate and you were there which meant that we didn't have to still get into the car and drive to the trails. 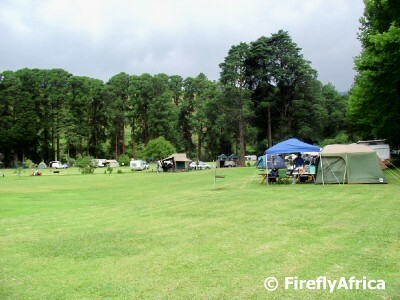 The camp site is perfectly situated for the nature lover. I could sit in my chair and have a view of the mountains above me while the sound of the river running past the camp site was just what I needed to wind down. The facilities at Mahai may not be brand spanking new but it was kept perfectly clean at all times by the very friendly and courteous staff. I was very impressed with security as well with the guards patrolling the area very thoroughly, especially at night. Before our arrival the one thing that bothered us most was the fact that we heard there was no swimming pool, but being able to swim at Cascades in the Mahai River more than made up for it. The other problem with camping there in the summer is that the area falls in the summer rainfall area and normally gets thunder showers in the afternoons. Unfortunately for us while there the whole summer rainfall area of South Africa received unprecedented rains which caused major flooding in areas. We didn't quite wash away, but it was very wet and the rivers came down in flood. I have to add though that even with the rain we had a marvelous time at Mahai and I will really recommend it to anybody who would like to have a mountain / close to nature holiday. 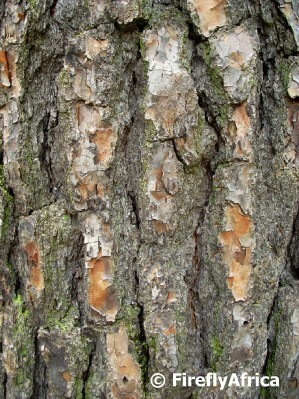 I'm always looking for something to photograph and while camping I noticed the difference in the bark on trees all within ten meters from our tent. This immediately offered the opportunity for a Random... theme posts. 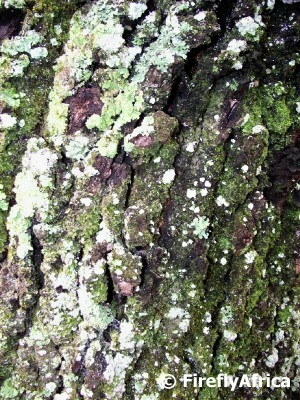 Random tree bark, not to be mistaken by a dog's bark.